Fabricated from heavy gauge stainless steel which is show polished to a beautiful finish. 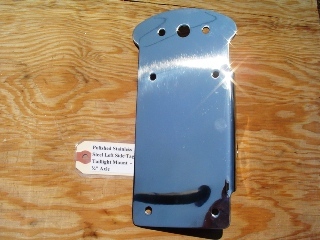 Designed to mount on left side thru a 3/4" axle or thru a custom fabricated tab with a 3/4" Bolt. Made to be fitted with any standard cateye taillight. Can also use our Maltese Cross taillight which has the same bolt pattern.